With so many teachers, followers and propagators around the world, Yoga has carved a niche of its own amongst fitness freaks. 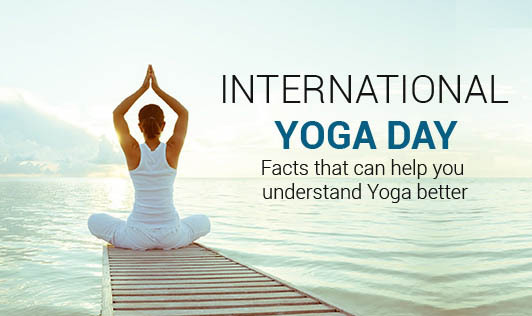 On this special day, let’s take a look at some of the pointers that can actually help us connect better with this amazing fitness mantra called ‘Yoga’. Yoga means ‘to combine’, ‘to use’, and ‘to harness’, depending upon the context in which it is used. In Panini literature, the conceptual meaning of this word emerges from two principal words which stand for ‘to join’ and ‘to concentrate’. Perhaps, this is the reason why Yoga comprises of poses that helps us combine and concentrate our energy for the betterment of physical and mental health. The origin of Yoga can be traced back to around 15,000 years ago when the first teacher- Aadi Guru, shared his wisdom with seven of his followers- the Sapta Rishis, while meditating at the foothills of the Himalayas. This is when Yoga was born, and India became recognized as the homeland of this very beautiful exercise and meditation form. The first teacher, Aadi Guru had extensive knowledge about the workings of the human body, mind, and behavior patterns. He, however, could not convert all his knowledge into a manuscript. Various disciples of Yoga have, time and again, developed various books and manuals to spread his teachings far and wide. Yoga, as per history, was diversified into various branches of learning such as Hatha yoga, Raja yoga, Laya yoga, and so on. The seven followers of Aadi Guru (the first teacher) helped to spread the word about Yoga in seven different parts of the world- South America, Central Asia, Middle East, North Africa, the Himalayas, and the Indian Peninsula. All these centers became distinct schools of learning and have followers till date. All of these sub-divisions are known to bring about healthy changes in the life of a yogi. They help to stay motivated, eat healthy and in the right quantity, practice right postures, workout effectively, and repel negative thoughts. Yoga can rightly be called as the perfect recipe for attaining complete wellbeing, if followed correctly as well as religiously. The greatness of Yoga lies in the fact that it has not lost its relevance even after thousands of years have passed since its discovery. Millions of people are benefitted from this discipline and the followers continue to increase every day. The basic aim of yoga is to attain eternal peace and this is exactly what everybody has been seeking since ages.